The installation meeting of Preston Guild Lodge No 4408 saw David Parker install his father, also called David, in the master’s chair. He was, in effect, returning the compliment paid to him when his father had the pleasure of installing him as master of the lodge. three years earlier. David Winder (left) congratulates David Parker Snr on his return to the master’s chair. The principal guest of the evening was Assistant Provincial Grand Master David Winder, who was accompanied by Preston Group Chairman Steve Bolton and grand officers Ian Greenwood and David Rhodes. They were supported by the Provincial Junior Grand Warden Barry Dickinson, Deputy Grand Director of Ceremonies Jason Dell and acting Provincial grand officers, Garry Norris and Peter Ledder. The lodge was opened by David Parker Jnr with the administrative business of the lodge being swiftly concluded. 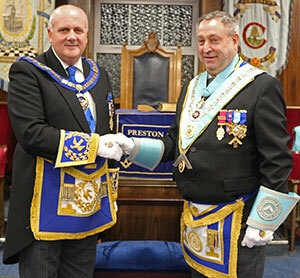 The lodge was raised to the third degree before the Provincial Deputy DC Jason Bell, entered to announce the presence of Assistant Provincial Grand Master David Winder. David duly entered accompanied by grand and acting Provincial grand officers to be formally welcomed by the WM. Salutations were given before the lodge returned to the second degree. David Snr was then presented to the WM for installation as the next master of the lodge by lodge member John Baron. Having been reminded of his forthcoming duties as master by the WM, David recited his obligation with regards to those duties before the lodge returned to the third degree. A board of installed masters was declared, and David Snr was installed in the master’s chair with due ceremony fitting for a past master, by David Jr.
As part of the ceremony, the working tools of the third degree were presented by David Gregson, those of the second degree by Eddie Taylor and those of the first degree by master Mason, Mathew Spencer, all of whom gave praiseworthy presentations. The officers were appointed and invested in turn. Tim Horton assuming the position of senior warden for the first time was informed of his duties by Eddie Taylor who went on to address both wardens, following Richard James having been appointed junior warden. The address to the lodge stewards was given by John Baron. The other appointed officers, having held their respective offices on a previous occasion, were not addressed. David Jr, as the installing master, concluded his part in the ceremony by formally, and excellently, investing David Snr with the Hall Stone Jewel, in recognition of the lodge’s status as a ‘Hall Stone Lodge’. Ray Beech closes the master’s song with a toast. David Snr, as master, was addressed in a commendable manner, by Richard James with the final address, that to the lodge brethren, being given by the principal guest, David Winder. At the conclusion of the ceremony David Winder brought the congratulations and best wishes of the Provincial Grand Master Tony Harrison, to David Snr. in taking the chair for the second time and to David Jr for the way in which he had installed his father and successor into the chair. He concluded his comments on behalf of the Provincial Grand Master by passing round the lodge and individually congratulating all those who had a part to play in what had been an enjoyable ceremony. David Snr, as master, responded by thanking David for his generous comments on behalf of the Provincial Grand Master and had the pleasure of presenting him with five cheques, each for the sum of £500. The first was a donation in support of The Foxton Centre, an organisation that provides support for vulnerable adults and young people. The second was in support of the Rosemere Cancer Foundation with the third being in support of the Royal Navy and Royal Marines Charity. The fourth donation was in support of St Catherine’s Hospice and the final donation went to the MCF 2021 Festival. On behalf of the Provincial Grand Master, David thanked the lodge for the five generous donations in the cause of charity and then had the greatest of pleasure in presenting master Mason, Matthew Spencer, with his Grand Lodge certificate by way of an excellent delivery of a shortened version of the formal words that support such an occasion. Not to feel outdone, Matthew was informed that he would hear a full explanation of the Grand Lodge certificate on some future occasion. 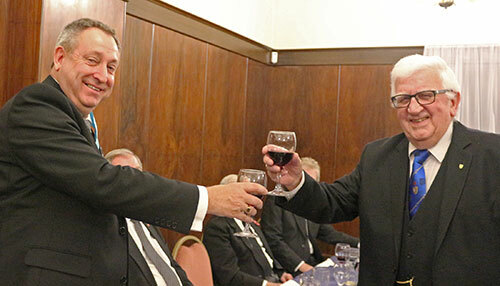 Later in the evening, in response to the toast to the grand officers, David Winder thanked the lodge for the warm welcome he had received, especially as this was his second official visit in two months. He reminded the brethren that the great thing about Freemasonry was its tolerance that meant, acceptance of differing styles, views and ages, with its only requirement being sound morals and a belief in a supreme being. With the lodge’s centenary not too far away, David encouraged the lodge to future proof itself and thereby provide a path to continue and reach its bicentenary. He maintained that the lodge must be attractive, not only to its members, but to those it hoped to recruit and retain. It must not only have humility but flexibility with a willingness to change and to be contemporary whilst still holding the values, ethics and landmarks of the order. The key message he made was to look through the eyes of those the lodge hoped to attract. As guardians of the lodge and the key to its future, it is up to the members to make that difference by being positive and individually taking responsibility to seek out suitable candidates. He encouraged the brethren to be open about their Freemasonry, otherwise, if they don’t talk about it, how could a lodge hope to attract new members. Picture left: David Parker Snr (right) presents flowers to David Winder. Picture right: David Parker Jr (right) presents flowers to WM David. Moving on, he noted it was always a special pleasure to see a son installing his father in the master’s chair, particularly so, when the said father had previously installed his son. He congratulated all those who had a part to play in the ceremony for their excellent work in lodge. He continued by thanking lodge members, David Gregson, for all the work he does outside the lodge in support of the Masonic hall, and Phil Cragg for the many years’ service to the Preston Group. He thought it wonderful to have the occasion supported by grand officers, thanking fellow Manchester United supporter and group chairman, Steve Bolton, for his invitation to attend. He was also pleased to have the support of all the acting Provincial grand officers during their year in office. Continuing, David was pleased to see so many brethren wearing the bright new Provincial tie and the Festival Jewel. His thanks went out to all those who have already pledged to support the Festival along with encouragement to those who have yet to take that step. He encouraged those making individual donations to where possible, use the white envelope scheme and thereby obtain gift aid which puts an extra 25% on top of the specific donation. Similarly, he asked brethren to maximise their support of the Masonic hall by holding their charitable and social functions in the hall and, at the same time, by inviting non-Masonic friends to join in providing a doorway to increasing lodge membership. He exhorted the brethren to enjoy their Freemasonry and to be strong enough to talk openly about it to non-Masons and in doing so future proof their lodge. David closed his response by thanking the lodge members for the magnificent charitable donations made earlier and wished the lodge well in its future proofing quest. The festive celebrations continued, to be further enhanced by a delightful rendition of the master’s song given by Ray Beech accompanied by Howard Linaker on the piano.The evening was rounded off with a presentation of a bouquet of flowers to David for him to pass to his wife Sue, as an appreciation from the lodge for being without David’s company for another evening. Similarly, David Snr received a bouquet of flowers from the lodge for his wife Jane with similar sentiments.